Click on the photo and see all the photos of Pousada Solar dos Navegantes. WiFi available in all areas, Room service, Hot tub, Outdoor pool, Airport shuttle, Bicycle rental, Car hire, Shuttle service (surcharge), Airport shuttle (surcharge), 24-hour front desk, Safety deposit box, Tour desk, Terrace, Sun terrace, Laundry, Daily maid service, Non-smoking rooms, Family rooms, Air conditioning. 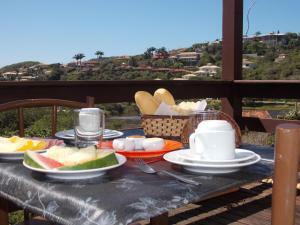 This charming guesthouse is within 5-minutes walk from Buzio´s most beautiful beaches. It offers a softly-illuminated outdoor pool on the rooftop, jacuzzi and furnished terrace with panoramic views. The spacious rooms at Pousada Solar dos Navegantes have tiled floors and neutral colors. All feature air conditioning and fan. Free WiFi is available. Guests at Solar dos Navegantes can enjoy a daily breakfast buffet and 24-hour room service. For leisure, Pousada Solar is 500 metres from downtown Buzios, where guests can enjoy several boutiques and bars. Pousada Solar dos Navegantes is 1 km from João Fernandes Beach, and 17 km away from Cabo Frio Bus Station. An airport shuttle and car rental service are available.